In a magical world of scientific discoveries where even the impossible seems real, three kids with special powers create something so miraculous it may change the world. Explore four exciting worlds. Meet three imaginative kid inventors. Invent creatures with a cool scientist. Battle a greedy doctor whose henchmen are following your every move. The Dr Egg Adventures are jam packed with entertainment, thrills, lurking dangers and fun experiences for children 7 and over. Are you ready for the adventure of a lifetime? In a magical, sometimes sinister world of scientific discoveries, where even the impossible seems real, greedy Dr Mole has taken control with his giant SEED CORPORATION. In his vast biotech empire, spreading from the high-rise hilltop towers, to the dry brown farmlands, starvation and food shortages are everyday occurrences. As Dr Mole ruthlessly experiments on children and animals to try and find the secrets to life, he collects every living seed with the hope of one day controlling the entire world’s food supplies! Meanwhile Dr Mole’s rival, Dr Egg, has created a flying egg spy to track his greedy nemesis and reclaim his stolen inventions, including the infamous square tomato! But just as Dr Mole’s greed grows out of control, three special kids enter the picture. There’s Ardash, the boy with no belly button who’s literally perfect. He’s been protected from every disease but still he’s not happy. He’s left home in search of the disease that killed his father, and might just find it at Dr Mole – or Dr Egg’s – door. Cornelia, conceived after her mother and father ate some of Dr Mole’s GM corn, possesses special powers like talking to animals; no wonder Dr Mole is keen to steal her secrets. Then there’s Vivi, the daughter of a man who has lost his ear in an accident with a snappy bull terrier. She will do anything to make her father happy, and desperately hopes to grow her father a new ear! She asks Dr Egg to help her and together they create something quite unexpected – a Tank Child! Based on the AWGIE award-winning theatrical production by Catherine Fargher, Dr Egg and the Man with No Ear and three other fables, this innovative, fantastical and aesthetically superb interactive trans-media production is suitable for a family audience. The Dr Egg Adventures will be developed by director Maia Horniak, writer Catherine Fargher, trans-media project manager Danielle Wiessner, script editor/writer Gina Roncoli, designer Jonathon Oxlade and animator Chris More of Studio Organic, in a style that may appeal to fans of Tim Burton, Sean Tan, Jim Henson and Neil Gaiman’s graphic novels. As a team we are excited about creating a truly innovative work that integrates hand-drawn illustration, animation, puppetry and theatrical design. We believe this unique style and the stories’ exploration of genetic science, coupled with the project’s trans-media and education potential creates a distinctive selling point. The largely 7+ audience will be able to explore the story as well as interact with animated gaming elements and ‘collect’ objects such as seeds or body parts. Users can make ethical choices about creations that may be scientifically ‘successful’ or ‘dangerous mistakes’. The educational browser seeks to appeal to a range of learning levels and will go further to encourage student’s creative thinking, decision-making, and ethical explorations in relation to the natural environment and living things around them via its multi-user online gaming format. As the kids make their way from their worlds to the laboratories, all three find themselves in the scary slum lanes, where gangs of mutant thugs, “dumped” after failed SEEDCORP experiments, roam the streets. 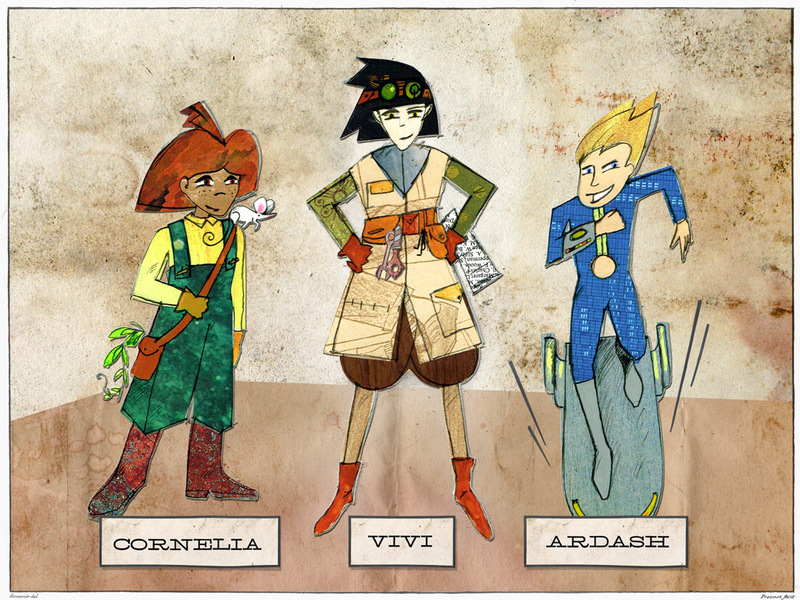 Soon enough Ardash, Cornelia, Vivi and the Tank Child are kidnapped by thugs and taken to Dr Mole’s hybrid helpers, and find themselves en route to SEEDCORP. But Dr Mole gets more than he bargained for in this trio of kids with special powers! Before long Cornelia convinces Vivi and Ardash and her faithful mouse to join her and rally the animals and creatures together to start a rebellion big enough to overtake the empire. Will Ardash, Vivi and Cornelia be able to save to world and help Dr Egg? The Literature and Inter-Arts boards of the Australia Council have funded the writing and development of the interactive story beats and media assets for the project. The products currently in development are The Dr Egg Adventures TV episodes/webisodes with the potential for AR interactivity, an engaging interactive storybook with an in-built game mechanic, an interactive educational online browser, as well as a hard copy publication. An exciting story-world: The Dr Egg series of fantastical scientific adventure stories forms the basis of this storyworld. A distinctive aesthetic style: Integrating a highly distinctive aesthetic style, The Dr Egg Adventures use illustration, collage, animation and theatricalized design to entice the imagination. Trans-media potential: As children and users seek to take their Dr Egg Adventures experiences off- page, this storyworld has the potential to be incorporated into an animated TV series with Augmented Reality (AR) tags, stand alone games, mobile cross-platform Aps, published books and graphic novels, as well as a range of toys. Educational potential: The Dr Egg Adventures storyworld features genetic science themes and introduces ethical decision making, creating strong educational and cross-platform potential, with the Science, Maths, History, English curriculum years 3 to 8. Characters to meet: Each of The Dr Egg Adventures starts in a world with its own special character – an incredible teenage inventor who is the hero of a quest and can be followed directly by readers. Their quests and adventures are narrated by the elusive and stealthy Snake Narrator whose call to action is loud and clear – these characters need your help to protect their family, friends and animals and to save their worlds from the immoral greed of Dr Mole and his giant SEED CORPORATION! Rich worlds to explore: Each of the Worlds is set in a particular landscape, reminiscent of real world environments like farms, modern cities and slums, but with a futuristic twist, as they are part of the totalitarian empire created by Dr Mole. Maia Horniak - director/co-producer Maia began her film studies at the worlds most reputable film school, FAMU in Prague, and worked on Universal and Miramax feature productions in LA and Prague. Maia did her Honours in Digital Media at the Royal Art Academy in Copenhagen, and then completed a Masters in Film Directing at the Australian Film Television and Radio School (AFTRS) in 2005; where she was awarded the prestigious Gilbert and Tobin Award for the ʻMost Significant and Promising Body of Workʼ. Maia has directed over ten short films, a TV series pilot, a one-hour Tele-movie, and several TV commercials and music videos. Her short films have had international success, screening at over thirty esteemed international film festivals including Milan, Sydney, Bermuda, Brooklyn, Palm Springs, Brussels, Edmonton and her film 'Loveproof' was invited to Cannes for 2007. In 2006 she won the prestigious Outstanding Film Maker Award at HATCHFEST USA after being chosen as 1 of 10 groundbreaking young filmmakers from around the world. Maiaʼs recent commercial work was also one of four finalists in the whole Asia Pacific region to be nominated for the 2007 Kodak New Director AWARD, and in 2010 Maia was the winner of the OPTUS MTV one80 project with the trailer “The Sellers”. Catherine Fargher - writer/co-producer/creative director, Dr Egg Digital Catherine is an award-winning scriptwriter, performer and teacher working in radio, contemporary performance, new media/hybrid arts, puppetry, television, film and theatre. She has training from the University of Technology Sydney, specializing in scriptwriting, as well as the University of Wollongong Faculty Creative Arts where she undertook a Doctorate in hybrid/new media performance writing. As a writer, Catherine has had over twenty scripts produced for companies including the Sydney Opera House, Sidetrack Theatre, Vitalstatistix, Terrapin Puppet Theatre, and the Australian National Broadcasting Corporation. Her play Dr Egg and the Man with No Ear, a puppet theatre and new media production produced by the Sydney Opera House has received critical acclaim and toured the US and Canada from 2008-2010. She is currently developing a digital/new media publication of her original bioethical fables, including Dr Egg and The Man with No Ear. Catherine won the 2010 AWGIE (national scriptwriting awards) award for her ABC radio play The Violin Player and the 2011 AWGIE for Children’s Theatre forDr Egg and The Man with No Ear. Gina Roncoli - script editor/writer Gina is an award-winning writer, script editor and producer, who has been writing and script editing for film and television since graduating from the AFTRS in 1989. In 1990 she received funding from the Australian Film Commission to co-write and produce Canto A La Vida. It screened on the ABC and won the 1990 AFI Award for Best Documentary before winning various international awards, including the Special Jury Prize at the 1990 San Francisco International Film Festival. Since then Gina has developed, written and script edited over 50 hours of television for various producers and broadcasters, and has been funded to script edit numerous feature films in development. Awards she has won include an Australian Writer’s Guild AWGIE Award for Best Children’s Script in 2003, for which she was again nominated in 2006. As well as writing, script editing and producing, she has an extensive knowledge of production and development funding, having worked as a Project Officer for the NSW Film and Television Office between 1996-8, where she managed over 200 applications for development and production investment. Gina has also assessed scripts for various other funding bodies and organisations, including the Film Finance Corporation and the Australian Writers’ Guild, and has taught courses in screen-writing and script editing for the AFTRS. Before working as a screenwriter Gina was a journalist for print and broadcast. Danielle Wiessner - trans-media project manager/co-producer Danielle is an award winning (AFI, MPSE & ASSG) sonic and visual multi-disciplinary artist & designer With over 28yrs experience in the arts industry, her body of work comprises picture editorial, sound design and music production and post-production management for numerous film, television and cross-disciplinary multi-media projects. She also specialises in ADR and VO dramaturgy and direction. Danielle is currently studying a Master of Cross Disciplinary Art & Design at College Of Fine Arts UNSW. She recently worked with Sarah Gibson and Sue Maslin and mentored Composer and sound designer Sharon Jakovsky on the production of the ABC new media broadband documentary and interactive work Re:enchantment, and most recently on George Millers Happy Feet Two. Jonathon Oxlade - designer/illustrator Jonathon studied Illustration and Sculpture at the Queensland College of Art, since leaving he has trained with Kid Praha in the Czech Republic focusing on puppet design and construction. He has designed set and costumes for Kite Theatre, Koomeba Jdarra, The Real TV Project, Zen Zen Zo, LaBoite Theatre, Windmill Performing Arts, Arena Theatre Company, The QTC, Bell Shakespeare, DR EGG AND THE MAN WITH NO EAR for The Sydney Opera House and Victorian Arts Centre. Jonathon also creates installation works including THE RED TREE installation for QPACS Out of the Box, illustrated for Picture Books including THE EMPTY CITY, the EDIE AMELIA series by Sophie Lee, and re-branded WINDMILL under the title of Company Visual Artist. Jonathon was Festival Designer for the 2010 OUT OF THE BOX FESTIVAL. Jonathon received 2005 and 2009 Matilda Awards. 2009 Matilda Awards Best Designer. Crichton Award for New Illustrator’s ‘THE EMPTY CITY’ Shortlisted book. Windmill’s GRUG recently won the 2011 Victor Award at IPAY Showcase, Tampa Florida. Jonathon was awarded the 'Lord Mayors Fellowship' to attend the PRAGUE QUADRENNIEL of Scenography and Theatre Architecture. Chris More - animator/co-designer Chris studied Electronic Design and Interactive Media at Swinburne and his work with the moving image has led to several creative collaborations for live performance and theatre, including, For Windmill Theatre: School Dance, Wizard of Oz and Pinocchio; For Arena Theatre Company: Star Chaser, Girl Who Cried Wolf, Skid 180 and Criminology; (co-production with Malthouse Theatre).Chris is the creative director of Studio Organic and works in multimedia and interaction design, He has worked in a broad spectrum of media from traditional print work, web, installation and interiors to motion graphics, live performance and theatre. Chris is interested in exploring art and design where new media, creative technology, interactivity, live performance and graphic design overlap. Chris’s process is one of creative collaboration driven by a deep passion for design. Michael Theiler and Peret Von Sturmer, KPOW audio - interactive sound design After completing a Master of Arts in Sound Design at the Australian Film Television and Radio School, Michael joined Team Bondi, contributing to the sound of the five million selling AAA game L.A. Noire. Capitalising on that momentum, he founded Kpow Audio with Peret von Sturmer, catering to the Interactive Media Industry. Peret has worked in varied audio roles, from artist development at Floating Point Music, to engineering, to television doing the sound effects and ambient audio in Wildboys, to being the Audio Design Lead on the five million selling game L.A. Noire. His experience and skills are unparalleled. Kpow Audio is a successful audio company providing sound for multimedia productions. They are dedicated to bringing story and characters to life using carefully crafted, skillfully woven sound. They specialize in delivering richly detailed, precise and specific audio solutions. They have experience with projects ranging from multi-million dollar productions to small independent projects, and thoroughly enjoy working with the variety of people and productions these varied projects deliver. David Barber - composer David has studied both composition and performance at the Australian Institute of Music (AIM) before graduating from the Australian Film, Television & Radio School’s (AFTRS) screen music course. Equally accomplished in both orchestration; programming; and composition, David has worked as part of the music department for feature films such as Red Dog (2011) and Drift (2013). He was also a member of the score preparation team for Happy Feet 2 in 2011. For his unique skill set, David has been hired to work as assistant to some of Australia’s finest film composers such as Chris Gordon and Martin Armiger. David’s interests lie in the blend of electronic textures with acoustic elements, with an emphasis on experimentation and originality. He has incorporated these concepts into his work fordocumentary, TV, over 30 short films, and feature film Seeing the Elephant 2012. David has been a regular guest lecturer at AFTRS. As well as film and TV, David has written music for a number of transmedia, cross‐platform projects, the most recent of which being The Dr Egg Adventures. Zina Kaye - interactive developer Zina is an experienced founder of several creative, internet and IT related companies including HOLLY (ex House of Laudanum).Zina is also a consultant to marketing managers and senior management in systems that combine online and offline environments. She develops measurable strategies that recover the initial investment for her clients within 2-6 months.Clients include: Sydney Dance Company, Griffin Theatre Company, Design and Art Australia Online, University of New South Wales, New South Books and Bazmark Inq. Individual creative clients include Vincent Ward, David Tremlett, and Dani Marti. She was one of the founding members of the XCHANGE Project Net Audio Network that received the Award of Distinction at the PRIX Ars Electronica, Linz, Austria, 1998. In 2004 The Line Ahead - a work co-situated at Melbourne Airport and ACMI was shown in the survey show 2004: Australian Culture Now. Zina has a critical understanding of the digital space, having practiced in it over 19 years. Mr. Snow - technical programmer Mr. Snow is Technical Leader at HOLLY (ex House of Laudanum). He has been responsible for the design and development of projects in the company for over 15 years. He is the architect behind the two-sided business Design and Art Australia Online. He has designed numerous internally faced data management systems including a casting intranet for Bazmark Inq and a system to annotate video now used by the University of Newcastle. Mr.Snow is an experienced project manager, and manages a team that is spread over a large number of continents. Mr.Snow is also a practising fine artist, and his latest research is into natural language recognition. He has created a door that reads the newspapers and makes decisions accordingly.